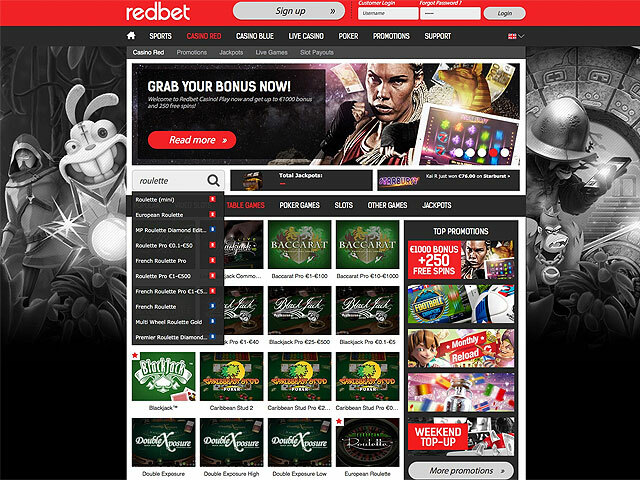 Operating online since 2002, Redbet is a no-download gambling venue that contains over 500 games from world-class developers, accepts sport bets and makes the games available to all users, whether registered or not. The casino is undoubtedly a 100% safe and secure venue which is certified by reputed auditing companies. With a 24/7 customer support and very helpful and informative FAQ page, Redbet makes sure players feel comfortable and have fun without any worries. All gaming content in the casino is broken into two sections. In Casino Blue, there are table games, slots and other products by Microgaming. In Casino Red, players have a wide choice of NetEnt and Betsoft powered games, all available both for real money and in a demo mode. There are also high-quality live roulette games managed by real dealers over a live video stream. The minimum cashout amount is €20, and players have no maximum limit on how much they can withdraw. The minimum deposit amount is €20, with payments accepted in EUR, NOK and SEK (the casino may vary the deposit amount for different countries). Live dealer roulette by Evolution Gaming. The casino has developed a bonus program for registered users that includes match bonuses up to €1500 on the first three deposits, 75% Weekend Top-Up. Unfortunately for roulette fans, betting in table games does not contribute towards meeting the house’s WR, though some bonuses that may appear from time to time do have a contribution rate in roulette.